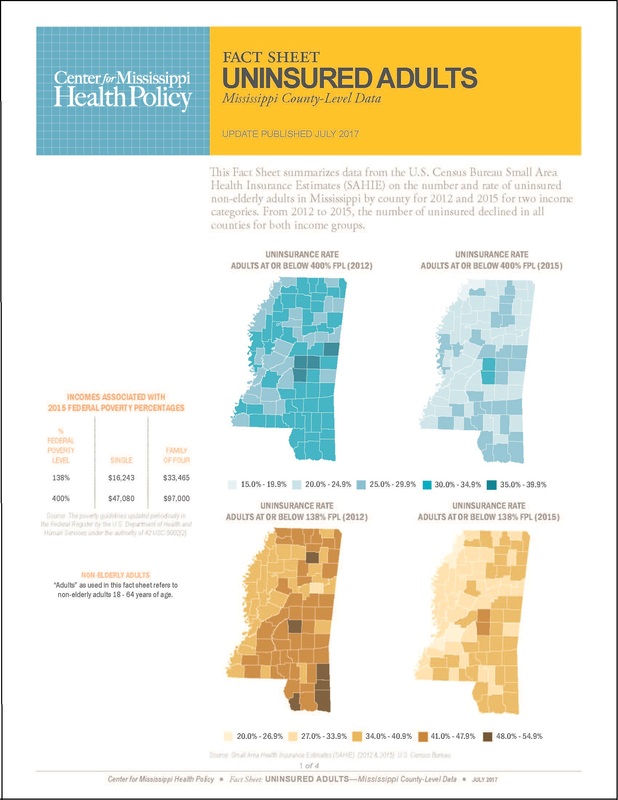 The Center for Mississippi Health Policy has prepared several documents that describe health insurance coverage in Mississippi: a fact sheet presenting county-level data on uninsured adults and two chartbooks that profile health insurance coverage for adults and children, outlining in particular the characteristics of those who are uninsured. This Fact Sheet shows the number and rate of uninsured non-elderly adults in each Mississippi county in 2015 for two income categories: those at or below 138% of the Federal Poverty Level (FPL) and those at or below 400% of the FPL. The Fact Sheet also notes for each county the change in the uninsurance rate for these groups from 2012 – 2015. Every county in Mississippi experienced a drop in the number of uninsured non-elderly adults during this period for both income categories. Compared to the nation, Mississippi adults are significantly more likely to be uninsured, to have higher rates of public coverage, and to have lower rates of private coverage. Approximately one out of five (19%) non-elderly adult Mississippians is uninsured, the lowest uninsurance rate in at least fifteen years. 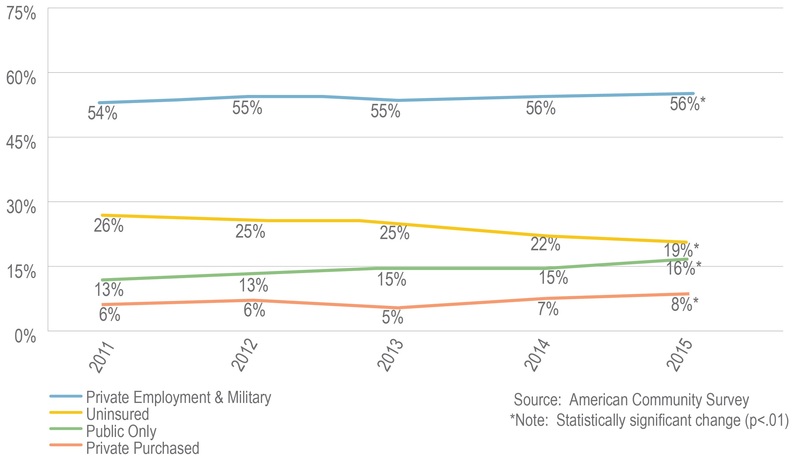 Most adults in Mississippi (56%) access health insurance through an employer. Significant changes to private purchased rates (14% increase), public coverage rates (7% increase), and uninsurance rates (14% decrease) occurred from 2014 to 2015. Over the five-year period from 2011 – 2015, there were significant changes to all health coverage categories. 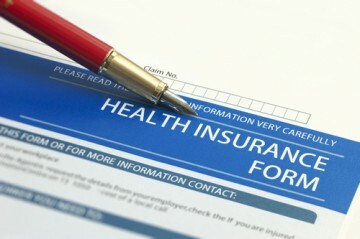 Private and public coverage rates increased, while uninsurance rates declined. Uninsurance rates are higher for adults with lower income, less education, and younger age. Nearly one-third (32%) of low-income non-elderly adults are uninsured. Most uninsured non-elderly adults are working and are primarily employed in low wage jobs in the retail, manufacturing, and service sectors. Uninsurance rates are significantly higher for childless adults compared to adult parents, regardless of work status (full-time, part-time, or not working) and income levels. Compared to the nation, Mississippi children are significantly more likely to have higher rates of public coverage and to have lower rates of private coverage. Only 5 percent of Mississippi children are uninsured, the lowest rate in at least fifteen years. 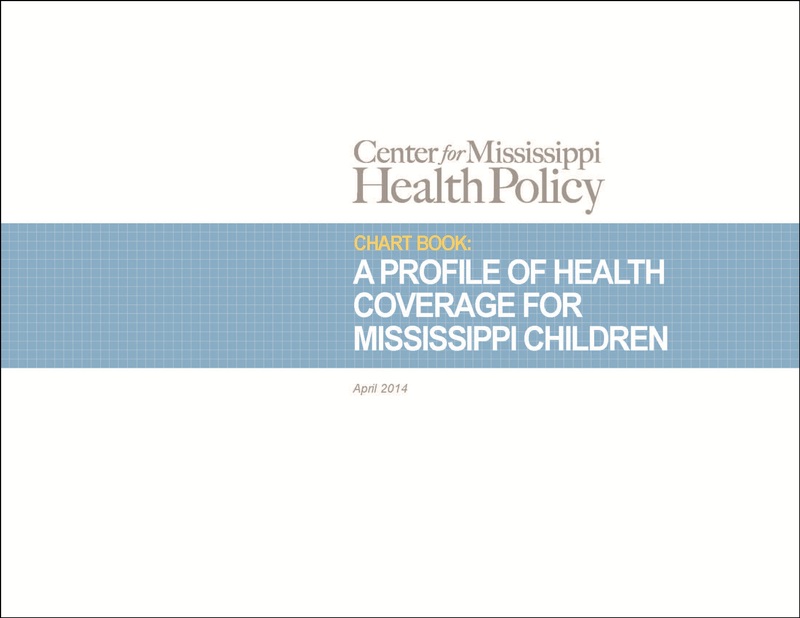 More than half (51%) of Mississippi children are covered by a public program, such as Medicaid or the Children’s Health Insurance Program (CHIP), and 39 percent are covered by private insurance. There were significant changes to all health insurance categories from 2011 through 2015. 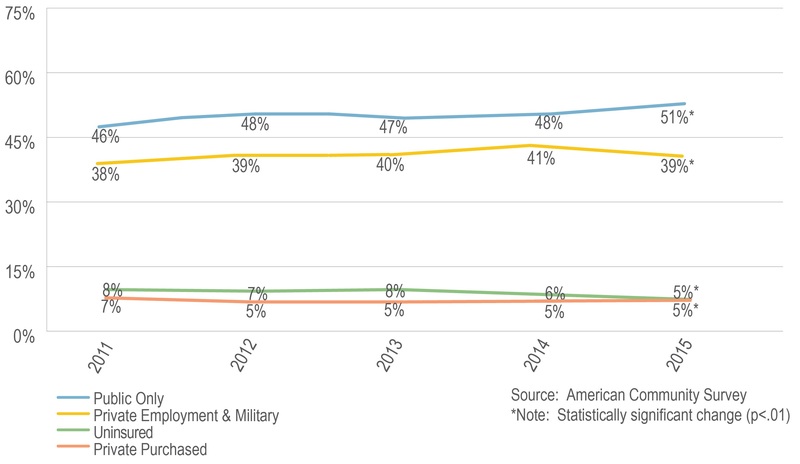 Private employment-based and military coverage rates, as well as public coverage rates, increased. In contrast, privately purchased coverage rates and uninsurance rates decreased. Almost three-quarters (70%) of uninsured children are income-eligible for public coverage through Medicaid or CHIP. About one out of five (22%) uninsured children live in families with incomes that would qualify for subsidies to assist with premium costs if coverage were purchased through the Health Insurance Marketplace. More than four out of five (84%) uninsured children live in families with a working adult. Each of the chartbooks contains additional findings. The chartbooks may be downloaded for children HERE and non-elderly adults HERE or by clicking on one of the links at the left of the page.